MOISTURE PENETRATION | H.R. Wellington Construction Inc.
All homes have moisture. Moisture can originate from any number of sources… cooking, showering, heating / cooling and even breathing. Even though you need some moisture in your home to breathe, too much moisture in your home can cause significant problems. 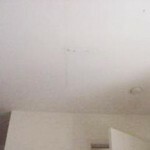 Excessive moisture in a home can lead to fungus, mold and/or pest problems. Of all the damage we find in San Francisco homes, fungus damage (Dryrot) is by far the most common. Dryrot is a form of fungus. The term “Dryrot” is something of a misnomer as the fungus requires elevated moisture (28-30%) in order to infect wood and to grow. Once established, the fungi can remain active in timber with moisture content over 30%. The fungus sends out rhizomorphs that conduct water to the body of the organism. Diseased wood must be removed beyond the visible evidence, and the area treated with a suitable fungicide. But first, the origin of the moisture must be determined and remediated. Unwanted moisture can be from a variety of sources. Roof leaks, gutters, exterior flashing, doors, windows, leaking pipes, plumbing fixtures, toilets and showers to name but a few. A moisture penetration inspection involves inspecting your home for excessive moisture conditions from both the interior and exterior of the structure. 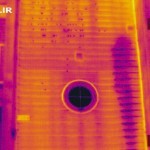 We perform a visual inspection using our years of experience, as well as utilizing the latest in thermal imaging technology. A non invasive, radio frequency moisture meter is used to check moisture content and to further evaluate areas of interest. Wellington can perform a Moisture Penetration Inspection of your entire home or of one specific area of concern to determine the origin of a leak. 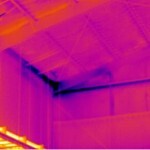 Using a thermal imager, the removal of wall and ceiling covers is usually not required. 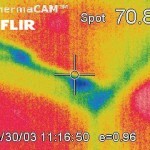 Prior to taking corrective action, thermal imaging can confirm the presence of moisture and/or damage without destructive testing.